Workers at the Special Psychiatric Health Care Center in Bielsko-Biala are forced to go on strike due to the worsening of their finanical situation. We have enough of the Director and the politicians saying their is no money. We have enough of the terrible staffing policy which leads to an overgrown administration. We have enough pretending that the hospital is doing well! The motor of this protest is the Union of Psychiatric and Rehab Workers, called on the initiatve of ZSP Health Care Workers. The strikers will not worker for 2 hours (between 9.00 and 11.00) on May 12. Then, from 11-13 there will be a protest. On March 13, a member of ZSP was interrogated by the police in connection with protests against Citibank. The union has organized a few protests in connection with the cases of three workers who are suing the multinational for discrimination, mobbing and sexual harrassment at work. Citibank will probably take members of ZSP to court and is trying to initiate a criminal case against them. They have asked the police to confiscate activists' computers in search of evidence. They complained to the police, among other things, that activists "defaced their logo" and wrote "Shitibank". The union will respond to the actions of the bank. It remarks that rather than tarnishing its reputation further by harrassing union activists and trying to send them to jail, they should resolve the conflict with the workers and make sure that those accused of these actions will not cause harm to anybody else. 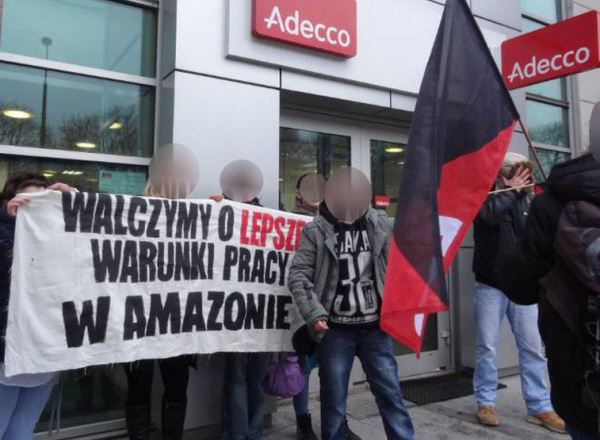 On February 27, ZSP organized a picket at Adecco work agency in Wroclaw regarding problems workers at the Amazon warehouse have been having. One of the concrete problems concerns a worker from Walbrzych who was employed in the Bielany Wroclawskie warehouse but who had an accident at work in December, caused by dragging heavy weights with a hand cart. Our colleague considers that Adecco did not help and has been making it difficult for him to collect any money. His contract was also terminated. Adecco also was pressuring him not to contact the media with this story. In the case of the accident, the Adecco representative at Amazon refused to drive the worker to the hospital to have the injury checked. Later, they caused various problems for him to get sick leave pay and are blaming the problems on the worker. We are demanding that Adecco rectify the situation and pay the 2.5 months' sick leave he is entitled to having suffered an accident at work. The local ZSP plans to increase the protests if this situation is not resolved quickly. Workers from Amazon can tell many stories about difficulties they have resolving any problems with the company. Many of them work for agencies. If they manage to contact people with their problems, they are told that the agency has to ask Amazon, please wait...... and the waiting goes on and on. In some cases, this can be very costly for the workers. As Amazon does not pay too much, some of their employees... oh sorry, I mean people who work in their centers... are eligible for different types of social aid or low-cost public housing. Only to apply, or to stay in public housing, from time to time one has to provide proof of their income. What they need is something signed and stamped by their employer. In the week of January 26-31, a number of actions were held at Amazon and Manpower in solidarity with workers at Amazon Poland, some of whom are employed through the Manpower agency. The conditions are extremely tough at Amazon but also there have been a number of irregularities, like late pay or lack of payments for some elements of their salary. The ZSP union in Amazon is fighting to regulate payments and to improve the overall working conditions. On Monday morning, the first actions of the week were held in Poland. Before Manpower opened at 8AM, workers from Amazon in Sady went to the Manpower office in Poznan. The workers employed through Manpower went up to the office while the rest protested outside, handing out leaflets. Many passersby were familiar with the bad working conditions at Amazon and expressed their support. The group also went to the Adecco office where Adecco workers spoke about money owed to them. In contrast with Manpower, Adecco reacted quite quickly, wiring money that was owed within a couple of hours of the picket. Manpower is still consulting with its legal department. Later in the day, our comrades from Manchester Solidarity Federation also appeared at a Manpower office with a picket. The management of the office were upset by the picket. The comrades handed out leaflets describing the situation and expressing their support of the workers who are organizing and fighting for their pay. On Tuesday the 27, the CNT-AIT from Salamanca went to a Manpower office in their city. Unionists from Salamanca are fighting for direct employment of workers at the Orange call center who are hired through Adecco and Randstad, so we have some common issues in Spain and Poland. They spread information about the struggle and sent their solidarity to workers in Amazon. Workers report that today, when the first shift was finished at Amazon and they were going to the company bus to go home, they were interrogated about their possible affiliation in ZSP. All of the workers were asked their names and whether they were members of the union. The workers were told that the company would check the internet for connections. Currently there are several Amazon workers' groups on the Internet and many workers are using Facebook accounts with their real names to communicate their grievances about the company. Bosses are policing the internet to weed out union members and pro-union workers. Of course we advise people not to take such risks and not to give up names. The intimidation of the workers is undoubtedly a response to the trouble Amazon has had with angry workers, bad press and labour inspectors. As a result of the campaign of ZSP, dozens of payments had to be made to workers who were shorted or not paid something. For now, the companies involved (Amazon and its agents Manpower and Adecco), have only been paying workers who have fought for what they were owed, but it is probably only the tip of the iceberg. We suspect that many more people are owed money. 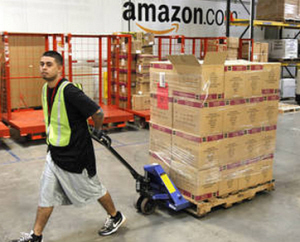 Four more workers employed at Amazon through Adecco agency were sent payments. The payments were made for breaks in the working time of 12 and 16 days, equivalent for work clothes/laundry and interest for late payments. We are happy that the agency paid, however we suppose many other workers had similar problems. Unfortunately the agencies do not want to check to see if other workers are entitled, but are only doing so if workers inform them of the problems. This shows that it is worth organizing yourself and fighting but unfortunately not everybody does this. We will continue to pursue such claims and hope that such problems will not happen in the future. 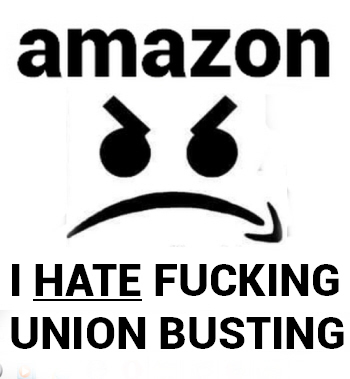 Better conditions for workers at Amazon NOW! 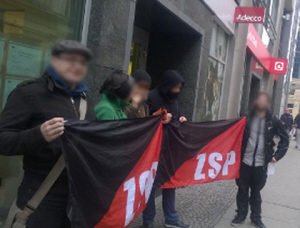 On January 12, ZSP Multibranch Union protested at Manpower headquarters in Warsaw about the ongoing problems of workers at Amazon employed through that agency, among others. A number of persistent problems have been reported by workers since the fulfillment centers in Sady and Bielany Wroclawskie opened a few months ago. We spoke to the legal department at Manpower for quite some time about specific cases and noted some additional suggestions for Amazon, such as that they should put the rules for awarding bonuses on paper, so that the criteria is transparent. This representative from Manpower will go to Amazon in two days, check the situation and pass on what we have said. We hope that we can resolve these concrete situations. However we were told that it is not possible to check the situation of all the workers, only the ones who specifically go to them with concrete issues. Every day more and more interesting things come to light at Amazon. We have seen that some agencies (for example Manpower) have provided workers with explanations of what was taken out of their salaries and which payments they were supposed to have. One of the things put on the pay slip was the equivalent for cleaning work clothes - because the company does not provide uniforms and the workers are entitled to this. Despite the fact that this is noted on the pay slip, workers we spoke to did not receive this. Another problem is a health and safety problem related to having to manually lug too heavy weights. With the weights they are required to drag around the warehouse, the workers should have forklifts. These new problems will be brought to the attention of all the parties ASAP. It has come to the attention of ZSP that in fact, some workers were given two contracts to sign: the first with the date they actually started work, the second with a new date, intended to „evidence” that they started later than they did. Unfortunately for Amazon and its temporary work agencies, Adecco, Manpower, Randstad, BHP training not only must be done during working hours, but also indicates the beginning of the factual labor relationship. We consider the signing of new contracts as an act of deliberate cheating and we will get you all for that.